At the turn of the century, a city’s park system was of upmost importance. Our country begun a move toward an urban society, but people still craved open spaces. New technologies had given families more free time, and a favorite place to spend that time time was at a park. 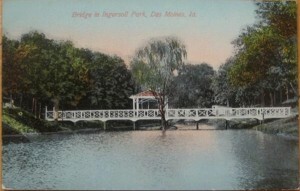 Des Moines, the setting for When Love Calls, had a beautiful park system. I wanted to highlight that in the book. Today, I’d like to share a few photos of some of the things I discovered in the city’s parks and mentioned in my book. I’ve been asked if there really was an Amerian Circle Swing Company. Indeed there was! Below is photo of the swing in Des Moines’ Union Park. 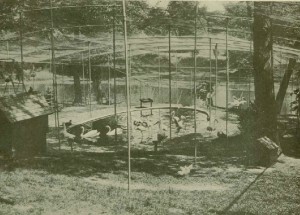 Besides the swing, the park also boasted an aviary. One of the oldest aviaries, the Raven Cage, is at the London Zoo. It’s dated 1829, but it was the 1904 St. Louis World’s Fair that sparked a national interest in aviaries. 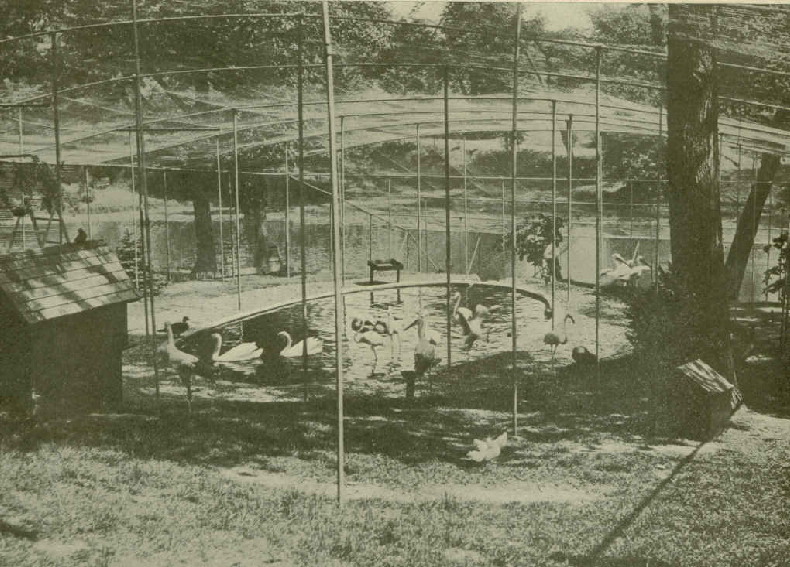 The St. Louis Zoo is still home to this aviary. 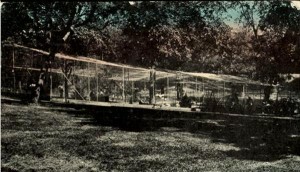 In 1904, it was the largest aviary every build at 84 feet wide, 228 feet long, and 50 feet high. 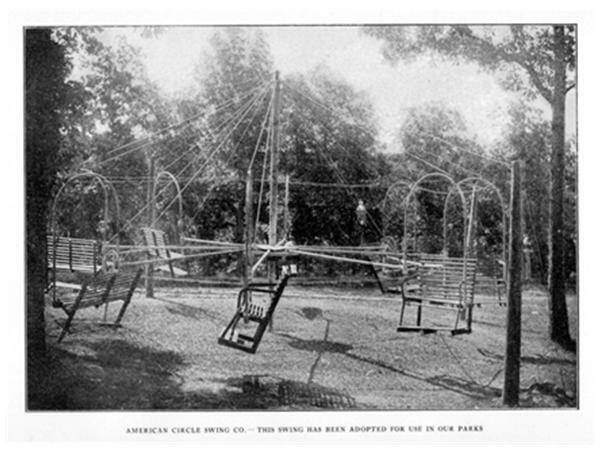 The aviary in Des Moines’ Union Park (pictured below and at the top of this post) was considerably smaller. Since I live near Omaha, Nebraska, I’ve had the opportunity to visit Henry Doorly Zoo’s Simmons Aviary. Opened in 1983, it’s one of the world’s largerst free-flight aviaries. Wouldn’t Hannah Gregory have loved that! Another Des Moines park mentioned in When Love Calls was Ingersoll Park. Below is a picture of the bridge mentioned in the story. And here’s the scene that happens on that bridge. A look that gave Lincoln goose bumps crossed Hannah’s face. She moistened her lips with the tip of her tongue, and he could no more keep from kissing her than keep her from taking chances. His lips claimed hers in a hot, velvety moment. Could she feel his love? Did she realize he’d do anything to protect her? Would she ever trust him with that corner of her heart just beyond his grasp? He wrapped his hands around her waist, drawing her closer, letting his lips say what his words could not. He dotted kisses on her jawline, and she tipped her head, giving him access to her neck. His lips moved restlessly across her neck, and he felt her body shudder against him. Drawing on every ounce of self-control, he cupped her face in his hands and pulled away. Her flushed face and swollen lips made him want to take her in his arms all over again, every day, for the rest of his life. She looked bewildered at the loss of his kisses. Lincoln smiled. Hannah had no idea what she stirred in him. He touched his lips to her forehead and drew her against his chest. The almond scent of her maple-syrup-colored hair reached him. Gently moving his thumb, he drew circles on the back of her neck. When had she won his heart? That first day they met, when she so bravely spoke to him? When she came to ask for help for her friend? When she pulled him into the lake? It wasn’t one moment. It was a hundred little ones. And he hoped there’d be a lifetime more to come. One of my favorite parts of writing is imagining the things I find in these old photos alive once again with people enjoying them. Times may change, but people will always find time to laugh, love, and play outdoors. What are you doing this summer to enjoy the outdoors? What’s your favorite way to “play” outside in the summer? On May 1, When Love Calls officially releases. I’m so excited! This is the first book in the Gregory Sisters Series and it’s set in 1908 in my home state of Iowa. It’s also set in Iowa’s capital, Des Moines. Researching a city’s history is always so much fun for me. I find most cities and towns have a rich history burried somewhere. One of my favorite things to talk about in this book was the state capitol building. 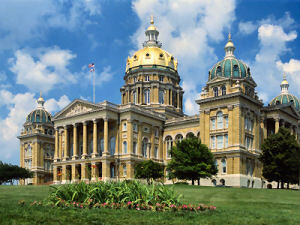 With its stunning gold dome, it’s been recognized as one of the most beautiful captiol’s in the country. It was built in between 1871 and 1886 at a cost of $2,873,294.59 at a time when the captol building of a state was a matter of state pride. 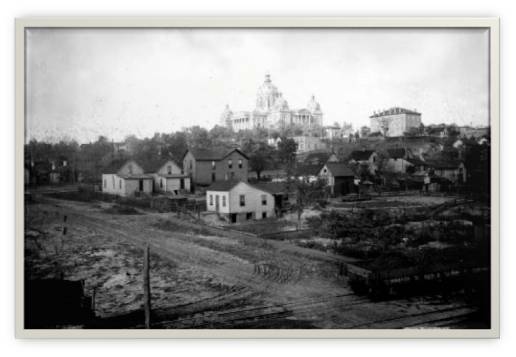 If you look closely at the picture on the right, you’ll notice the huge capitol is surrounded by small, wood frame houses and buildings. Can you imagine what some people where thinking while it was being built? The dome is covered in 100 troy ounces of 23.75 karat gold (nearly pure). If you rolled that much gold up, it would only be the size of a ball you could hold in your hand, less than 7 pounds. The gold orignially cost $8,800. When it was re-gilded in 1998-99, the bill came to $400,000. 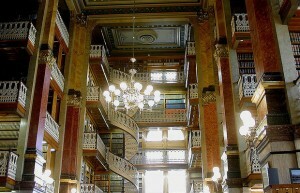 One of my favorite parts of the book was being able to share abou the State Law Library contained inside the capitol. 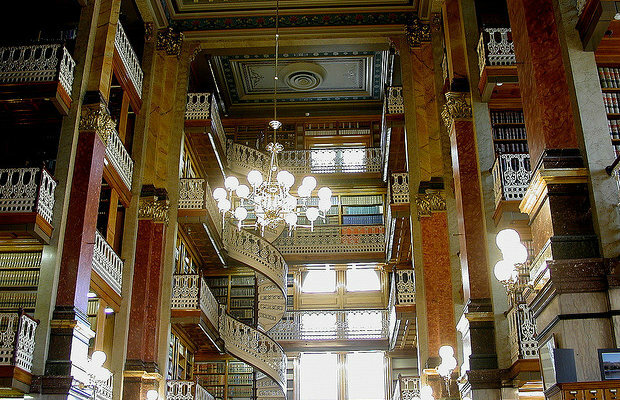 It regularly appears on lists of the most beautiful libraries in the world. And from the photo, I think you can see why. Next Friday, I want to take you up into the capitol’s dome. So don’t miss this step back in time. Have you visited your state capitol? Are there any unusual things about it? Please share, I’d love to hear about it. The Scavenger Hunt is Coming!